byro is a membership administration tool. byro is best suited to small and medium sized clubs/NGOs/associations of all kinds, with a focus on the DACH region. byro is heavily plugin based to help fit it to different requirements in different situations and countries. byro is stable and in active use in several communities. It is currently under active development. As byro is under active development, this feature list can become outdated. Please open issues for features you are missing! 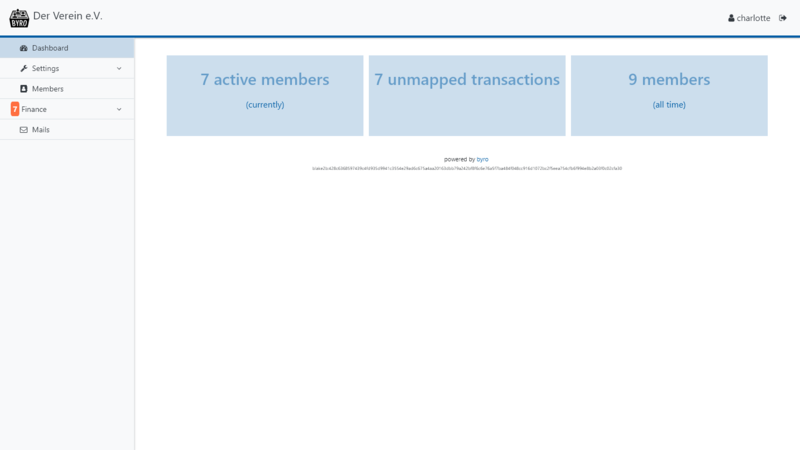 Member management: Add, and edit members and their data. Membership management: Add and change the membership fees a member should pay. Add custom member data: Track non-standard member data by adding a plugin to byro. There are plenty of example plugins and developer documentation to help you. Import payment data: Inbuilt support for CSV imports. Import and match payment data to members via custom methods, added by plugins. Send mails: All mails can be reviewed before they are sent out. You can also edit the default mail templates and add new ones. See member balances. You can also check every single transaction at any time. Upload member specific documents: (either for or by them); optionally send them per mail automatically. Let members interact: Members can choose to make their data (which parts is their decision) visible to other members. Having a look at the member directory helps them interact directly with other members. Please note that byro is a tool for tracking member data and payments, and the administrative acts around it. byro does support bookkeeping and transactions, but it is not a complete bookkeeping tool (yet). © Copyright 2017 Revision 9959a00e.